Read an exclusive interview with Steve Pemberton and Mark Gatiss here! ‘The League of Gentlemen’s Apocalypse’. Directed by Steve Bendelack (League of Gentlemen, Little Britain) ‘The League of Gentlemen’s Apocalypse’ is brought to you from the team behind the multi-award winning comedy TV series The League of Gentlemen. Created by and starring Mark Gatiss, Steve Pemberton, Reece Shearsmith and Jeremy Dyson, The League of Gentlemen’s Apocalypse is due for national release as a full length, all action movie feature on June 3rd 2005. The fictional world of Royston Vasey is facing apocalypse and the only way to avert disaster is for our nightmarish cast of characters to find a way into the real world and confront their creators. 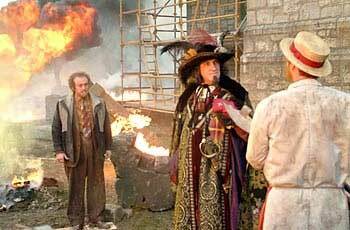 From present day Soho to the fictional film world of 17th Century Britain, the residents must overcome countless bizarre obstacles in their bid to return Royston Vasey to safety. In addition to featuring the most beloved characters from the original TV series, this darkly hilarious movie adventure also features a whole host of freakish new creations and cameo performances from famous faces such as David Warner, Bernard Hill, Victoria Wood, Emily Woof, Peter Kay and Simon Pegg. The League of Gentlemen’s Apocalypse is a Universal Studios and Film Four presentation of a Tiger Aspect Pictures production in association with Hell’s Kitchen International. 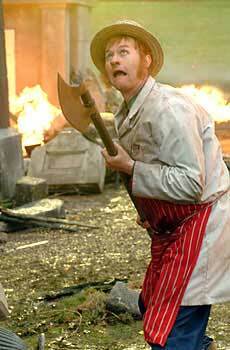 The League of Gentlemen’s Apocalypse is directed by Steve Bendelack and produced by Greg Brenman and Ed Guiney. Executive Producers are Peter Bennett-Jones, Andrew Lowe and The League of Gentlemen. ‘The League of Gentlemen’s Apocalypse’ is distributed in the UK and Ireland by UIP and opens nationwide on April 22nd 2005. The Wicklow Gap is not an inherently evil place. It’s actually one of Ireland’s purest and most beautiful physical features, a high mountain pass through colourful, glistening valley country. On a clear day, you would be wonderstruck. But today the rain clouds are low enough to claw at the ground, carried by a pitiless sub-zero wind, mixing with the fog and blanking everything out. It’s a miasma of dread, I tell you. So sinister it’s funny. Which is exactly the atmosphere The League of Gentlemen have always courted. And right in the middle of the Gap is where the new full-length movie-version of that horrific BBC hit comedy series is being shot. My mother, who lives nearby, kindly drives me up there. She’s never watched The League of Gentlemen. I could tell her that she definitely wouldn’t get it or like it, but that would start an argument. She doesn’t see how they could possibly be filming on a day like this. At first, it’s hard to tell what’s happening – the production car park is full, but there’s no one around. Then Steve Pemberton, actor, writer, and co-founder of The League, strides out of the ominous whiteness toward his trailer, dressed in full Bavarian folk-costume as Herr Lipp, the programme’s repugnant and hilarious German tour guide and pederast. He’s followed by a rag-tag squad of miserable boy scouts. They’re filming all right. As it turns out, the weather isn’t quite hostile enough for their needs, so they’ve got the wind and rain machines running on full power down at the set. It is here, in the back seat of a Land Rover, half-sunk into the black mud, that I meet Mark Gatiss, another founding Gentleman – also a co-writer of the forthcoming, re-invented Dr Who series, and the author of a frisky new comic novel called The Vesuvius Club. Gatiss is a reasonably handsome man – my mother said so when I showed her his author photograph – but today he’s so hideous I can barely look at him. He’s currently between scenes as Hillary Briss, the vile local butcher whose extremely suspicious and addictive “special meat” caused a plague of fatal nosebleeds on the TV show. His overalls are stained with viscera and his teeth are coated in rust-coloured filth. Gatiss, Pemberton, Reece Shearsmith, and Jeremy Dyson met as drama students at Bretton Hall in Wakefield, West Yorkshire. All they really had in common was a shared taste for the nasty classics of British sci-fi and horror cinema – Witchfinder General, The Quartermass Experiment, The Wicker Man, the Amicus studio’s portmanteau movies Torture Garden and Dead Of Night. Gatiss had become a weirdness connoisseur growing up in Sedgefield, Durham, opposite an Edwardian psychiatric hospital where his father sometimes worked as an engineer. He recalls bonding with Pemberton over an early sketch they wrote, about a perfectly innocent but vaguely scary father sitting in the dark at the end of his son’s bed. Between them, The League of Gentlemen have since gradually constructed their own myth from that kind of everyday strangeness and irrational fear. Royston Vasey looks like any other dismal British post-industrial village, but the joke is that your nagging feelings of dread and oppression are entirely justified in this case – the place is cut off from the world and populated by monstrous malcontents who will drag you into their psychosis. Their sicknesses are so absurd and extreme, and your doom so inevitable, that you’ve really got to laugh. 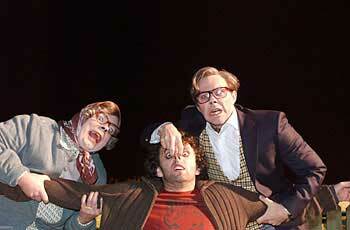 And every resident is played by either Gatiss, Pemberton or Shearsmith (Jeremy Dyson can write, but he can’t act). 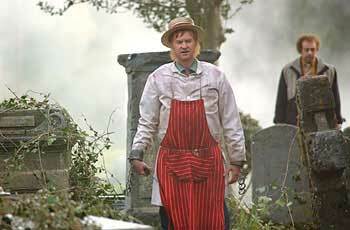 While Pemberton’s characters tend to be insidiously menacing (Herr Lipp, toad-enthusiast Harvey Denton) and Shearsmith’s are often repressing some kind of demented rage (Geoff the frustrated local businessman, hell-fixated preacher Reverend Bernice), Gatiss generally plays the more unfortunate souls – the gruesome accident-prone local vet Dr Chinnery, failed glam-rocker Les McQueen. He grins with the butcher’s bloody teeth and I try not to flinch. As an actor and scriptwriter, the “sheer joy of The League of Gentlemen has been writing the sort of thing you’ve always wanted to be in, and then actually being in it”. Gatiss and co are control freaks, and they worked independently, at their own painstaking pace, on the screenplay for the film. Long-time fan and Queer As Folk writer Russell T Davies was put in charge, hired like-minded writers such as Gatiss, and cast the intensely watchable character actor Christopher Ecclestone as The Doctor. The result, says Gatiss, entirely biased but highly excited, is “a brilliant reinvention”. His own episode has just been filmed, so Gatiss’ involvement recently came to an end. “It was hard to say goodbye to it. A real wrench,” he admits. His new novel, though, was a total relief to finish. The Vesuvius Club is a saucy romp through early-Edwardian London – “What my father would call ‘racy’,” says Gatiss – narrated by a screamingly louche bisexual portrait painter and secret agent named Lucifer Box, who kills with impunity, fornicates with gusto, and always picks the right colour flower for his buttonhole. The wild plot is bit too noisy and busy, over-stuffed with thrilling chases, fiendish twists and droll asides, but it’s a load of fun to read. Gatiss insisted that the publishers include a subtitle proclaiming the story “A Bit Of Fluff”. Which doesn’t mean it was fun to write. The book is dedicated to his boyfriend Ian, whom Gatiss describes as the love of his life. They’ve be been together for five years, and I was wondering, given the recent debates over the issue in the European Parliament and during the American presidential race, if they would ever get married. For a guy with a deep and serious love of British pulp, genre, and schlock, Gatiss has a pretty refined aesthetic palette. He shares his taste in art, if by no means his lifestyle, with his own dandified hero Lucifer Box, who takes time out from sleuthing and carousing to exhalt Velazquez and spit on El Greco. It’s funny, I say, as a make-up lady leans into the Land Rover to touch up the nauseating features of Hillary Briss, that Gatiss of all people should demand beauty from his art. 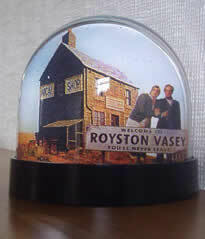 According to these photo's the Film is to be called Royston Vasey...which is good news for our site http://www.roystonvasey.co.uk! Read the full article here http://www.showbizireland.com/news/october04/03-gentlemen01.shtml but the pics are on the latest news Page! Newsflash! - Steve Bendelack confirmed to direct League of Gentlemen Film! "I'm going to be in The League Of Gentlemen film," laughs the Manchester-born actor. "They wrote a part especially for me, which is very flattering. A few years ago they invited me to be in their TV Christmas special but I couldn't do it as I was living and working in America at the time. "However, I became friends with them and now they have invited me to be in their film. "Because I had been living in America, I hadn't seen the show when it was on TV, so when I watched some tapes I couldn't understand what was going on! "They are really very clever and they are very good actors. It is a strange show, but I really like it and now I've seen all the tapes I am a huge fan. "It is a real change for me too; it gives me a chance to be a bit stupid! I like to do comedy but rarely get asked to do it so to have the opportunity to do something like The League Of Gentlemen and hopefully make people laugh is great. "They haven't got me dressing up as a woman as yet but you never know!" David Warner has been in the acting business for more than 40 years with a varied career starring in Hollywood blockbusters like Titanic and The Omen and TV classic dramas like The Choir and Twin Peaks. League Of Gentlemen Movie? Extraordinary! aren't overly fond of things — or people — that aren't local. for abject terror rather than fascination. The Wicker Man) have in store for us with their bid for cinema infamy. really a BBC project, a large chunk of the financing is coming from FilmFour. This is an unofficial League of Gentlemen Web Site!